Subscribe to the Lab to transform what is and invent what’s next. Achieve innovation mastery to solve what’s next for your organization. Convene groups of insiders and outsiders to co-create what’s next. You know your now isn’t your next. We help you the break biological and cultural biases and bust through the status quo, so you can get from today’s what is to tomorrow’s what might be. Join the leaders who use our Think Wrong language, frameworks, tools, and techniques to radically improves their odds of successful innovation, change, and growth by helping them make smarter decisions and investment—faster. 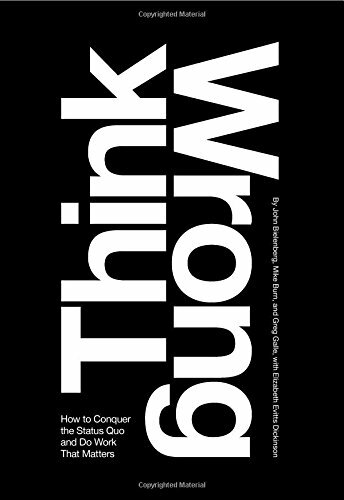 Think Wrong is our radical problem-solving system that helps you overcome the orthodoxies, biases and assumptions of the status quo and delivers the insights and killer solutions for what’s next. All of us find ourselves on the predictable path of how things have been, how things are and how they will be. This status quo is forged by the synaptic connections in our brains and our culture. Our Think Wrong Practices empower you to blaze your own bold path when it matters most—and to resist the biological and cultural forces trying to snap you back to business as usual. It’s time to think wrong. Try the top Think Wrong Drills. Clients who think wrong to solve next. Find out why and how organizations like yours have thought wrong to transform what is—and invent what’s next.